Download "Race Matters. Household Asset Poverty by Race in North Carolina. 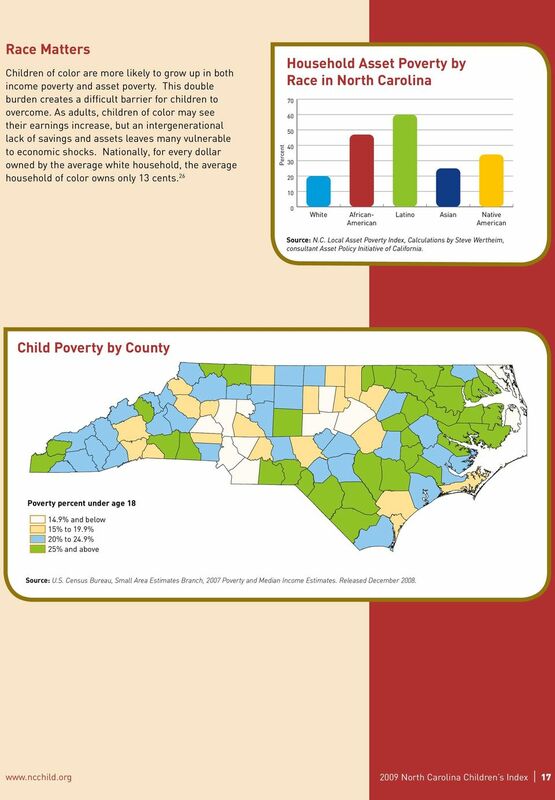 Child Poverty by County"
2 Goal 4: All Children are Provided the Opportunity and Resources to Succeed in their Education Education is one critical component to personal financial security and to a community s economic development. To have a comparative advantage in the future global marketplace, North Carolina will need to train more young people for the changing 21 st century economy. Educational institutions, from regulated childcare to preschool to K through 12, are the pipeline through which children can take advantage of opportunities and access new resources in pursuit of future success. A child s brain begins developing early and is heavily influenced by his or her experiences and environment. The first five years are a critical period of development and determine whether a child is ready to start school with his or her peers. In turn, school readiness has implications for school achievement and ultimately graduation. 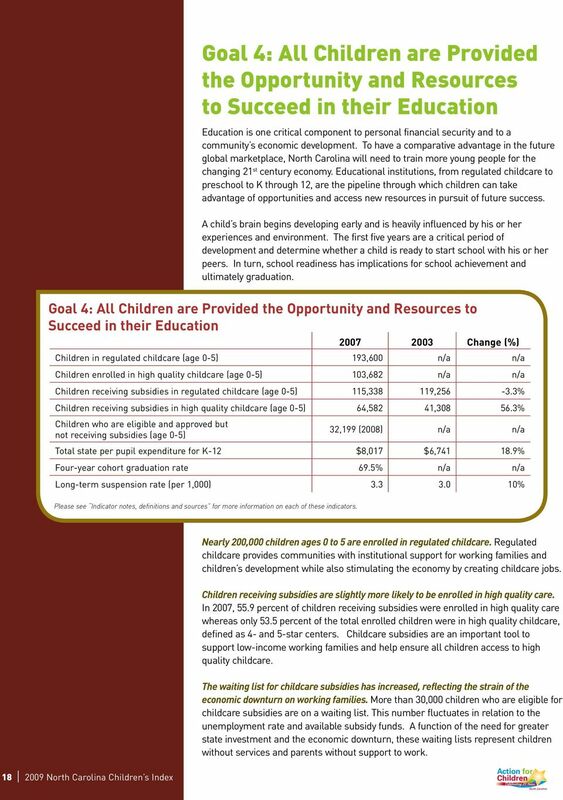 Goal 4: All Children are Provided the Opportunity and Resources to Succeed in their Education Change (%) Children in regulated childcare (age 0-5) 193,600 n/a n/a Children enrolled in high quality childcare (age 0-5) 103,682 n/a n/a Children receiving subsidies in regulated childcare (age 0-5) 115, , % Children receiving subsidies in high quality childcare (age 0-5) 64,582 41, % Children who are eligible and approved but not receiving subsidies (age 0-5) 32,199 (2008) n/a n/a Total state per pupil expenditure for K-12 $8,017 $6, % Four-year cohort graduation rate 69.5% n/a n/a Long-term suspension rate (per 1,000) % Please see Indicator notes, definitions and sources for more information on each of these indicators North Carolina Children s Index Nearly 200,000 children ages 0 to 5 are enrolled in regulated childcare. Regulated childcare provides communities with institutional support for working families and children s development while also stimulating the economy by creating childcare jobs. Children receiving subsidies are slightly more likely to be enrolled in high quality care. 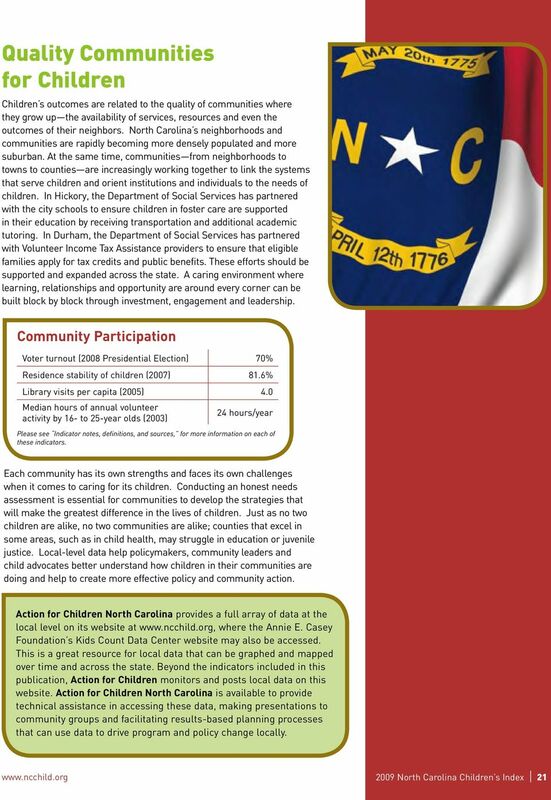 In 2007, 55.9 percent of children receiving subsidies were enrolled in high quality care whereas only 53.5 percent of the total enrolled children were in high quality childcare, defined as 4- and 5-star centers. Childcare subsidies are an important tool to support low-income working families and help ensure all children access to high quality childcare. The waiting list for childcare subsidies has increased, reflecting the strain of the economic downturn on working families. More than 30,000 children who are eligible for childcare subsidies are on a waiting list. This number fluctuates in relation to the unemployment rate and available subsidy funds. A function of the need for greater state investment and the economic downturn, these waiting lists represent children without services and parents without support to work. 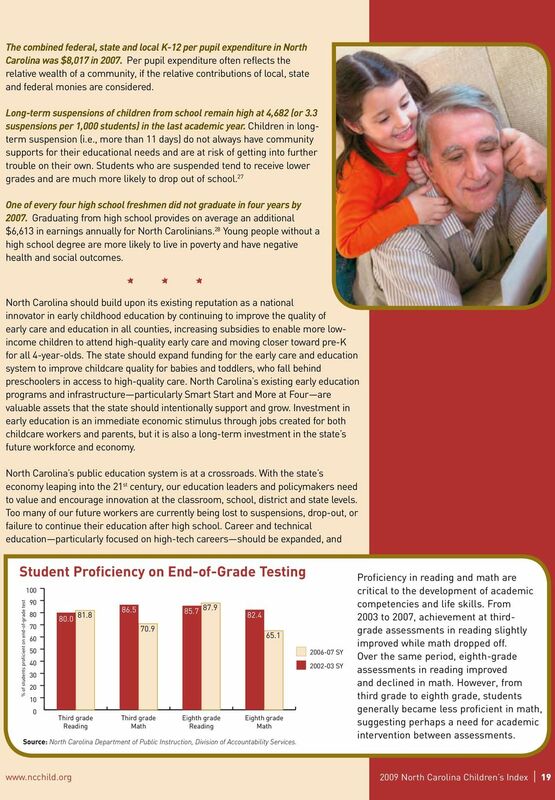 The Greenville County Schools homepage provides five goals for the school system (www.greenville.k12.sc.us/district/admin/stats/measures. COMMUNITIES IN ACTION LIFTING UP MICHIGAN S VULNERABLE QUICK FACTS CHILDREN ON KIDS ISSUES 2 0 1 1 2 0 1 2 D A T A W. K. K E L L O G G F O U N D AT I O N W K K F. O RG / M I C H I G A N 1 About the W.K. PATH NOT FOUND: DISPARITIES IN ACCESS TO COMPUTER SCIENCE COURSES IN CALIFORNIA HIGH SCHOOLS The Need for Computer Science Computing occupations are among the highestpaying & fastest-growing occupations.